Pennsylvania Route 291 (PA 291) is an east–west route in Pennsylvania that runs from U.S. Route 13 (US 13) in Trainer, Delaware County east to Interstate 76 (I-76) in South Philadelphia near the Walt Whitman Bridge and the South Philadelphia Sports Complex. Except for a short 1-mile (1.6 km) section between US 13 and the Chester/Trainer line, PA 291 is mostly a four-lane highway. It runs parallel to the Delaware River. The route passes through industrial areas near the river in Delaware County, serving Chester, Eddystone, Essington, and Lester. PA 291 enters Philadelphia near the Philadelphia International Airport, at which point it has an interchange with I-95. The route crosses the Schuylkill River on the George C. Platt Memorial Bridge and continues along Penrose Avenue to I-76. It has been designated the Industrial Heritage Highway. PA 291 was first designated by 1928 along an unpaved road between PA 420 in Prospect Park and PA 191. The route was extended west to US 13 in Eddystone by 1930 on a paved road. PA 291 was realigned to run from US 13 in Trainer to PA 420 in Essington by 1940. The route was extended to PA 191 in Philadelphia by 1950, following Industrial Highway. PA 291 was extended to US 611 (now PA 611) at Philadelphia City Hall in Center City Philadelphia along Penrose Avenue, Moyamensing Avenue, and Broad Street. A freeway was proposed along the PA 291 corridor between I-95 and I-76 from 1950 until the 1970s, when it was cancelled due to funding issues. The northern terminus was moved to its current location by 1989, with an extended PA 611 replacing PA 291 on Broad Street. Around 2000, the route was rebuilt as a five-lane road in Chester. PA 291 was realigned further to the west to bypass the Philadelphia International Airport in 2006. PA 291 begins at an intersection with US 13 near Delta Air Lines' Trainer Refinery in the borough of Trainer in Delaware County, heading southeast on two-lane undivided Price Street. The road passes between homes to the northeast and industrial areas to the southwest. The route makes a sharp curve to the northeast and becomes 2nd Street, crossing into the city of Chester and passing through urban residential and industrial areas. PA 291 continues northeast and becomes a five-lane road with a center left-turn lane as it passes more urban development and empty lots. The route comes to ramps that provide access from the eastbound direction of US 322 and to the westbound direction of US 322 just northwest of where that route crosses the Delaware River on the Commodore Barry Bridge. The road passes under the western approach of the Commodore Barry Bridge carrying US 322. Following this, PA 291 passes more urban homes and businesses. The route splits from 2nd Street and continues northeast as an unnamed road, crossing Chester Creek near Chester's City Hall and the William Penn Landing Site. PA 291 intersects the southern terminus of Pennsylvania Route 320 (Madison Street northbound and Upland Street southbound), at which point it becomes 4th Street. The road continues through commercial areas and intersects Morton Avenue, which connects to US 13 to the north. At this point, the route runs between Amtrak's Northeast Corridor to the northwest and the SCI Chester prison to the southeast before intersecting Harrah's Boulevard, which provides access to Harrah's Philadelphia casino and harness racetrack to the southeast along the Delaware River. The road continues northeast between the Amtrak Northeast Corridor to the northwest and Conrail Shared Assets Operations' Chester Secondary to the southeast, crossing the Ridley Creek out of Chester and into the borough of Eddystone. Here, PA 291 becomes Industrial Highway, a four-lane divided highway, and continues east, with the Northeast Corridor line heading northeast away from the highway. The road continues through industrial areas, passing to the north of Exelon's Eddystone Generating Station. The route crosses the Crum Creek into Ridley Township and passes through Boeing Defense, Space & Security's Vertical Lift helicopter plant. In this area, PA 291 intersects Stewart Avenue, which heads north to an interchange with I-95. Past this, the Chester Secondary heads farther south from the road as it passes more commercial establishments. The route crosses the Darby Creek into Tinicum Township and runs east past more businesses, intersecting the southern terminus of PA 420 to the north of Essington. Past this intersection, PA 291 continues east through commercial areas with some homes, becoming Governor Printz Boulevard. The route heads northeast into the community of Lester, where it splits into the one-way pair of South Governor Printz Boulevard eastbound and North Governor Printz Boulevard westbound, carrying two lanes in east direction and passing more development. The two directions rejoin as a four-lane divided highway with a wide median that runs near commercial establishments, coming to a ramp from northbound I-95 to eastbound PA 291 that merges in from the left. From here, the route continues east as a four-lane divided highway between I-95 to the north and a lake to the south, coming to a bridge over the Chester Secondary. At this point, PA 291 reaches the Philadelphia International Airport, where it turns north onto four-lane divided Bartram Avenue and crosses under I-95 while Industrial Highway continues east to the airport. After crossing under I-95, PA 291 enters the city of Philadelphia in Philadelphia County and curves to the northeast, running parallel to the Chester Secondary to the northwest, with the John Heinz National Wildlife Refuge at Tinicum located on the other side of the railroad tracks. The road passes under SEPTA's Airport Line leading to the airport at which point that railroad line merges with the Chester Secondary. The route continues northeast parallel to the Airport Line, coming to a partial interchange with I-95 that has ramps to and from the southbound lanes of I-95. Within this interchange, a park and ride lot is located southeast of the road. PA 291 passes to the northwest of business parks and hotels before it curves away from the railroad tracks near the Eastwick station and passes to the north of an airport employee parking lot, intersecting 84th Street. The route turns south onto two-lane undivided Island Avenue and passes under I-95 again, with a ramp to southbound I-95. On the edge of the Philadelphia International Airport property, PA 291 turns east onto six-lane undivided Penrose Avenue and passes more businesses, coming to a partial interchange with I-95 that has a ramp from northbound I-95 to PA 291 and a ramp from southbound PA 291 to southbound I-95. Past this interchange, the route becomes four lanes and ascends onto the George C. Platt Memorial Bridge, passing near industrial areas before crossing over the Schuylkill River. After crossing the river, the bridge passes over part of a large Sunoco oil refinery. After descending off the bridge, the route continues as four-lane divided Penrose Avenue near industrial areas. PA 291 intersects South 26th Street, which heads north to provide access to westbound I-76 (Schuylkill Expressway) and from eastbound I-76. Past this intersection, the road passes under CSX's Harrisburg Subdivision before becoming a five-lane road with a center left-turn lane and passing homes and businesses in South Philadelphia. PA 291 reaches its eastern terminus at an interchange with I-76, with access to the eastbound lanes of I-76 and from the westbound lanes of I-76. Past this, the road continues northeast as Moyamensing Avenue. When Pennsylvania first legislated routes in 1911, what would become PA 291 was not legislated as part of any route. PA 291 was first designated by 1928 to run from PA 420 in Prospect Park east to PA 191 along an unpaved road. By 1930, PA 291 was extended west to US 13 in Eddystone, following PA 420 south for a short concurrency before continuing west along its current alignment. The extended alignment of PA 291 was a paved road. By 1940, PA 291 was realigned to run from US 13 in Trainer east to PA 420 near Essington. The former alignment east of PA 420 became an unnumbered road. PA 291 was extended northeast to PA 191 (80th Street) in Philadelphia by 1950, following the newly built Industrial Highway in Tinicum Township before heading along Essington Avenue. In the 1950s, PA 291 was extended northeast to US 611 at Philadelphia City Hall in Center City Philadelphia, following Penrose Avenue, Moyamensing Avenue, and Broad Street toward Center City Philadelphia. This section replaced the PA 191 designation along Penrose Avenue, Moyamensing Avenue, and Broad Street. In the 1970s, the Airport Circle was removed. In 1950, the Philadelphia City Planning Commission proposed a PA 291 freeway along Penrose Avenue between the Delaware Expressway (I-95) near the Philadelphia International Airport and the Schuylkill Expressway (I-76). The freeway was to split into two alignments leading to I-76: one following South 26th Street to connect to westbound I-76 and the other following Penrose Avenue to connect to eastbound I-76. Plans for the PA 291 freeway were dropped in the 1970s because the Pennsylvania Department of Transportation halted a number of road projects due to funding issues. The northern terminus of PA 291 was cut back from PA 3 and PA 611 at Philadelphia City Hall to I-76 by 1989. The former portion of PA 291 along Broad Street was replaced by an extended PA 611. In 1999, PA 291 was realigned in Chester to a new five-lane alignment that connected 2nd Street and 4th Street to improve travel for trucks and attempt to revitalize Chester. Construction of the new alignment took two years. Before this, PA 291 continued east along 2nd Street and turned north on Crosby Street to reach 4th Street. Expansion of the road to five lanes through the remainder of Chester was slated to be complete in 2001. In 2005, a bill was introduced into the Pennsylvania General Assembly designating the portion of PA 291 through Chester as the Rosa Parks Memorial Highway in honor of civil rights activist Rosa Parks; this bill was signed into law by Governor Ed Rendell on October 27, 2006. In 2006, PA 291 was rerouted to use Bartram Avenue and Island Avenue around the Philadelphia International Airport instead of Industrial Highway due to runway expansion at the airport. In May 2011, a $42 million project began to rehabilitate the George C. Platt Memorial Bridge. The project was completed in June 2014. ^ a b Bureau of Maintenance and Operations (January 2015). Roadway Management System Straight Line Diagrams (Report) (2015 ed.). Pennsylvania Department of Transportation. Archived from the original on February 17, 2011. Retrieved June 30, 2015. ^ "Industrial Hwy Transportation Improvements, Route 291, LR-542, Chester, Delaware County: Environmental Impact Statement". Federal Highway Administration. 1986. Retrieved 8 April 2019. ^ a b c d e f Google (January 17, 2014). "Pennsylvania Route 291" (Map). Google Maps. Google. Retrieved January 17, 2014. ^ a b Philadelphia County, Pennsylvania Highway Map (PDF) (Map). PennDOT. 2013. Archived from the original (PDF) on July 18, 2011. Retrieved January 17, 2014. ^ Pennsylvania Highway Map (Philadelphia Metro) (Map). Gulf Oil. 1928. Retrieved November 8, 2007. ^ Tourist Map of Pennsylvania (PDF) (Map). Pennsylvania Department of Highways. 1930. Archived from the original (PDF) on July 5, 2011. Retrieved January 1, 2014. 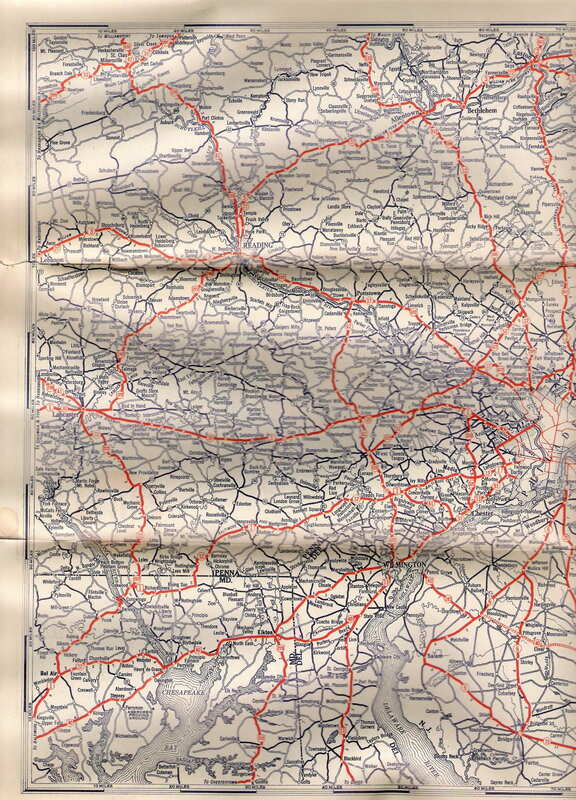 ^ Official Road Map of Pennsylvania (back) (PDF) (Map). Pennsylvania Department of Highways. 1940. Archived from the original (PDF) on July 18, 2011. Retrieved January 1, 2014. ^ Official Map of Pennsylvania (back) (PDF) (Map). Pennsylvania Department of Highways. 1960. Archived from the original (PDF) on September 30, 2011. Retrieved January 16, 2014. ^ Pennsylvania Official Transportation Map (back) (PDF) (Map). Pennsylvania Department of Transportation. 1980. Archived from the original (PDF) on July 24, 2011. Retrieved January 17, 2014. ^ Schuylkill Expressway, Roosevelt Boulevard Expressway and Vine Street Expressway (Report). Philadelphia City Planning Commission. 1950. ^ Nussbaum, Paul (August 19, 1984). "Schuylkill Carries the Load of Many Roads Left Unbuilt". The Philadelphia Inquirer. ^ a b Hardy, Dan (October 8, 1999). "End Of The Road For Construction Construction On Route 291 In Chester Is Finally Complete - For Now. A New Phase Of The Project Is Set To Begin In 2001". The Philadelphia Inquirer. Retrieved January 17, 2014. ^ Belden, Tom (September 30, 2006). "Road near airport to be rerouted". The Philadelphia Inquirer. Retrieved January 17, 2014. ^ "Platt Bridge Project Overview". Pennsylvania Department of Transportation. Archived from the original on October 5, 2012. Retrieved January 17, 2014. Wikimedia Commons has media related to Pennsylvania Route 291. This page was last edited on 20 April 2019, at 09:03 (UTC).